My first hand account of the ongoing search for health and wellness through a conscious focus on nutrition, cooking, ingenuity, and physical exertion. As an active stay at home mother of two young children, I spend large portions of my day in my kitchen inventing new recipes and reinventing old favorites into fun, healthy and delicious meals my whole family loves... especially while on the run... literally. This recipe has been sitting in my draft folder way too long. 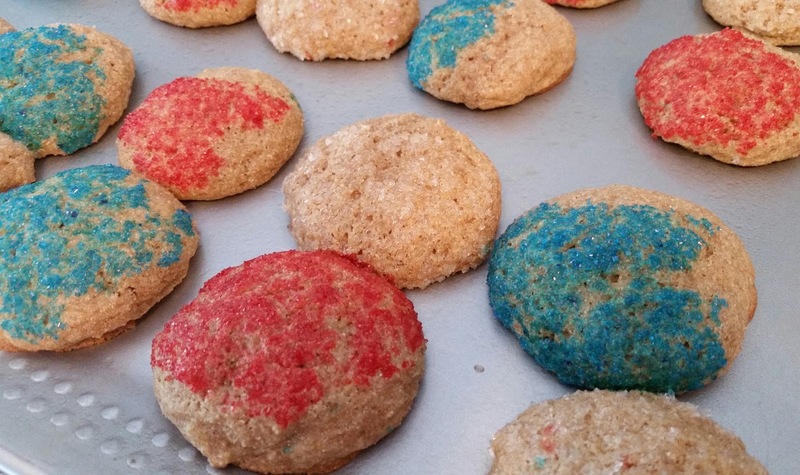 I made them years ago for a fourth of July party and they disappeared so quickly I never got a great close up, and consequently never got around to sharing the recipe for the last two and a half years. They are a very simple, moist, cake like cookie that I would compare closely to the Pumpkin Cookie recipe I shared in my very fist blog post. It's actually kind of funny that I also never got a photo of those cookies. It's usually a good thing when my treats disappear before they are documented. And it just means I should probably make them again! 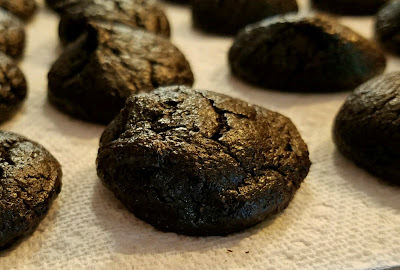 I love the simple flavor that the fresh organic butter and whole wheat flour provide, but these would be fabulous with a little orange or lemon zest mixed in, or almond extract instead of vanilla. I've even added in chocolate chips in a similar cookie recipe using ricotta cheese instead of yogurt that I plan to post later this week. Think of it as a basic cake like sugar cookie recipe that can be adjusted in numerous ways, and decorated for any occasion. And if the three full cups of whole wheat flour is a bit hearty for your taste, you could definitely lighten it up with a little white flour, or even a cup of almond flour as a replacement. Now it's time to get baking! 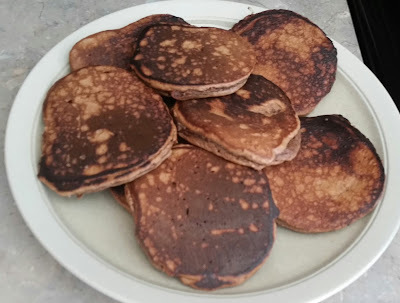 A friend of mine posted a recipe for pancakes made only with oats, bananas, peanut butter, and eggs, and although I know I had made something similar, I couldn't find it on my blog. That's because like dozens of other recipes I have made over the past few months, it was still in my draft folder. Not exactly the same as the one she shared, but just as deliciously healthy for you. And gluten free for those of you that need to avoid flour. Because they are made primarily with nut butter and eggs, as well as almond flour, the are very high in protein compared to regular pancakes. I did use chocolate hazelnut butter (one with less sugar than Nutella, although that would be delicious! ), so if you opt to use all almond butter or peanut butter or something with less added sugar, you may want to add in a mashed banana, or a few tablespoons of maple syrup, honey, or organic sugar, or just add more syrup on top when eating them. I actually ate mine plain however, because they were so flavorful. I did amend the recipe to add soymilk (or whatever milk you prefer) because my husband said they were too thick to cook properly without burning them slightly. I didn't mind, but as with all pancake recipes, you can adjust the ingredients slightly to get the pouring consistency you and your family prefer. Either way, next time you're craving a hearty pancake breakfast, definitely give this recipe a try. You won't be disappointed! Avocado Cookies? Yuck! I know, I get it. They don't sound good. Even to someone like me who loves avocado chocolate pudding, and makes cookies with pureed beans in them. But I promise, if I didn't tell you there was avocado in these you would never, ever guess. You would just think they were super fudgy little bites of dark chocolate goodness. It's no secret that I love to sneak healthy ingredients into baked goods so that I can get my kids, especially my daughter to eat fruits and vegetables without having to actually take a bite of a fruit or vegetable, so although there is chocolate and honey in the ingredients, I still think they provide a good amount of nutritious fuel for my family's active lifestyle. These are best made in a food processor so that the ingredients combine smoothly, and then stored in the freezer to maintain freshness. I made them small so they could be bite sized, but I am sure you could make them a little bit bigger and even add mini chocolate chips to them as well. The combination of avocado, almond butter, and eggs, along with the rich chocolate, cocoa and honey, make them the perfect sweet treat that is also full of vitamins, fiber and protein. And they are great served with a thin layer of peanut butter on top, or as a little cookie sandwich!